Young Justice comic series artist Christopher Jones provides The World's Finest with a closer look at Young Justice issue #8, which focuses on the character of Artemis. Below, Jones breaks down the issue, providing his thoughts on the issue and looking closer at certain aspects of the issue itself. Click on the thumbnails for a closer look at each image. I'm back! I've been encouraged to continue sharing my thoughts by way of a page-by-page breakdown of the latest issue of Young Justice. I'm happy to oblige, so here are my thoughts on Young Justice #8! Page 1: I tried to compose the opening page - including the panel shapes - to create a smooth flow of movement as Artemis draws an arrow, notches it, and draws the bowstring preparing the let fly. Pretty happy with the result. Page 2: And so it begins. Overall, I enjoyed drawing the big MONQI fight sequence, but by the end of the issue I was more than ready to be done with them! They're creepy, nasty little things in this sequence. Page 3: It was interesting drawing scenes that were depicted in an actual episode of the show (in this case, episode 5: "Schooled"). I tried to find new angles on the action, both to make the moments work their best as static comic book images as opposed to animation, but also to give fans a different view rather than just copying a screen grab. I also need to give a shout out to Zac Atkinson for his color work on this issue. The bulk of the interview is cutting between the Team fighting Amazo inside the school gym and Artemis fighting MONQIs outside. There are no lights on inside the gym, so everything is lit with the same bluish moonlight as the outdoor scenes and Zac does a great job making it feel like a dark night time scene without actually going so dark it's impossible to see. Page 4: Artemis pulls her crossbow - not entirely sure how that collapses down into her thigh holster. Page 6: The script called for the MONQI to cover Artemis' eyes in panel 1, and then its tail tightens around her neck in panel 2. I created a single image to include both these actions, but then divided it with a panel boarder so there was still a 1-2 beat to the actions. I thought this preserved the action as called for in the script but gave us a big close-up shot to break up the smaller action panels. 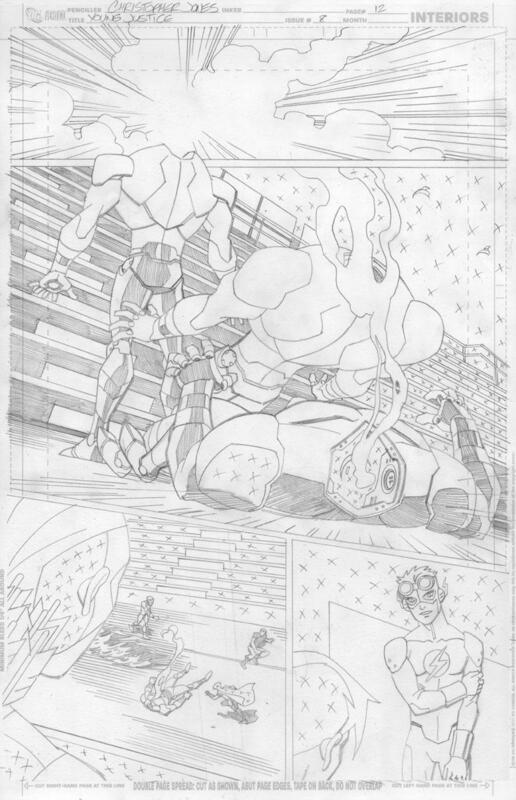 Page 7: Amazo was a lot of fun to draw. I love old Silver Age characters, and the Amazo design for the show is terrific. He's huge, and the segmenting of his robotic body makes him look like a big, deadly action figure! Page 8: This is an interesting page. I wanted to create a direct flow of the arrow's path in panels 2-4 which meant I needed to use the full diagonal area of the page. But since that sequence was preceded by a panel 1 that had to go in the upper left corner, I was stuck with having to make panels 2-4 read right to left which you usually don't do. 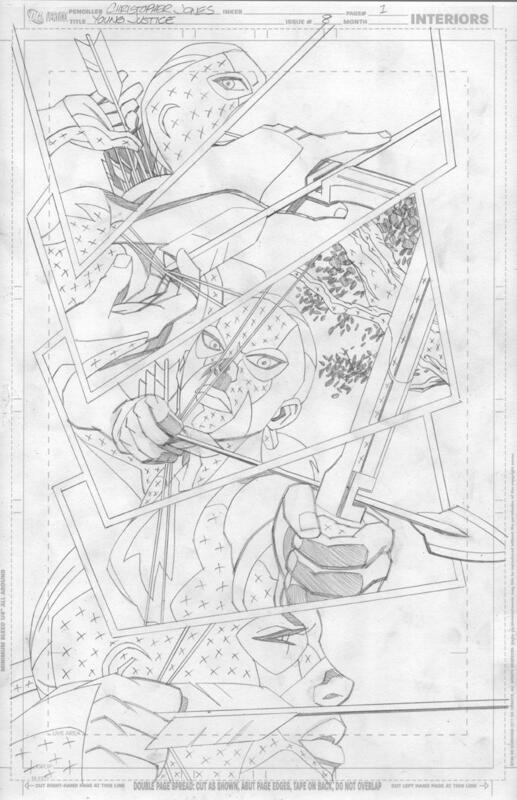 I was pretty happy with how it turned out, with the arrow from panel 2 breaking the frame and pointing towards Amazo in panel 3, then passing through him as he turns intangible in panel 4, still traveling in a direct line from it's trajectory in panel 2. The final panel with Robin seeing the arrow burying itself in the gymnasium floor is really close to how that moment looked in the TV episode, but it's tweaked slightly. I love how Zac colored the intangible, transparent Amazo. Very ghostly, very cool. Page 9: If I had it to do again I probably would have put borders or gutters around the panels on this page. Zac does a valiant job making the panels distinct by varying the background color with a gradient. Page 11: More ghostly Amazo. I managed to show Amazo as transparent in the line art this issue, drawing both the Amazo figure and the horizontal lines of the gymnasium bleachers, and Zac carried the effect through in the coloring. In issue #9, you'll see some shots of Miss Martian in "camouflage mode" which were accomplished by providing her figure as a separate layer over a background drawing which Zac then composited with some transparency at the coloring stage. You use different techniques depending on the specifics of the scene. 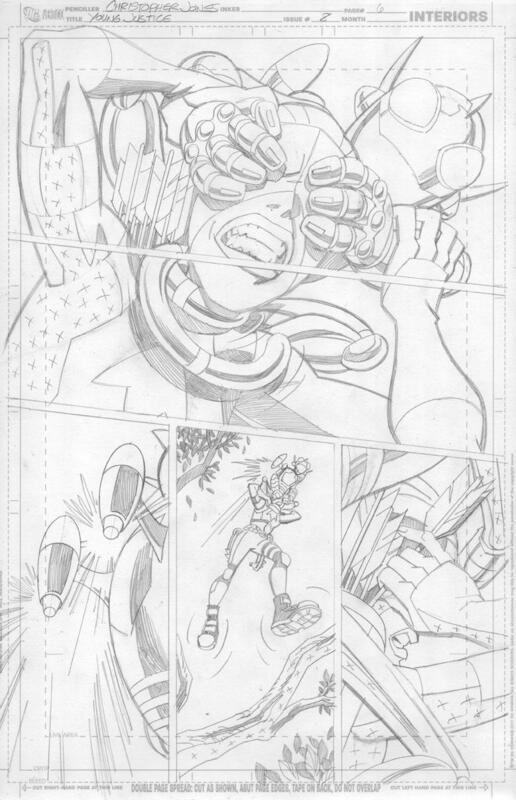 Page 12: This was scripted as a sequence of panels with Amazo's head exploding, then toppling, headless, to the floor. I ended up combining several panels into one panel with multiple images of Amazo falling, with his upright figure placed breaking into the frame of panel 1 so it's head would have been in the center of the explosion. I'm pretty happy with how it turned out! Page 15: Wow, who DOES that poster belong to...? Page 16: Isn't that always the way? You come home from a night of patrolling to find Batman and Green Arrow waiting for you in your living room? Page 18: Love the look on Artemis' mother's face in panel 4. I've seen a lot of people speculating about the connection between Artemis and Green Arrow, and a lot of people seem thrown by her adopting a green costume that seems to echo Green Arrow's look before meeting him as seen in the timeline of events in this story. I'm not privy to any of the behind-the-scenes decision making that went on in designing Artemis's costume for the TV show, but I'm actually not bothered by this. For one thing, a green costume for an archer I think could have as much to do with drawing inspiration from Robin Hood as Green Arrow. And even if it IS a Green Arrow reference, it's not like she'd never *heard* of Green Arrow before meeting him. He's the most famous and iconic archer hero in the DC Universe. I think it makes sense given her aspirations that she might have been inspired by Green Arrow even before he appeared in her living room with Batman. Pages 19-20: This is almost entirely a sequence seen in the TV episode 6 "Infiltrator." Again, I was trying to portray it accurately but change up the "camera angles" a bit. I still very much plan to stay active on Worlds Finest Online. I've really appreciated the support and the form to interact with fans of the projects I've been lucky enough to be involved with since my The Batman Strikes! days. 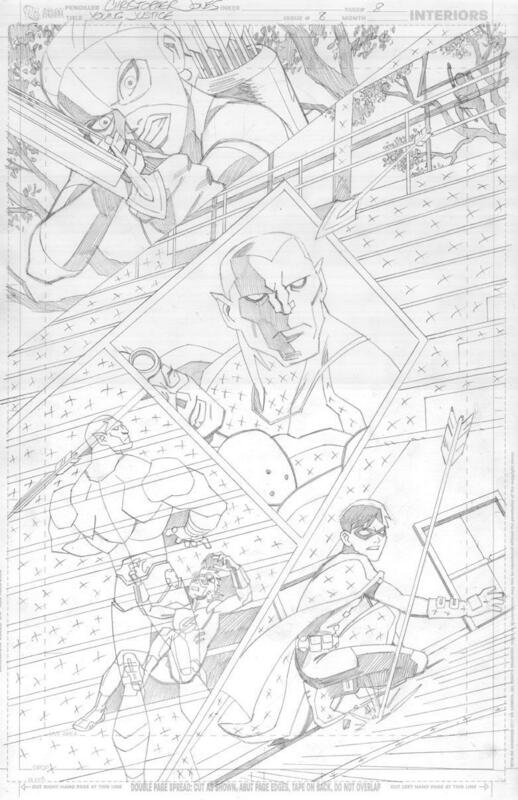 So please, check out my blog (and my gallery which you can link to) and I'll be back on World's Finest Online (or the Young Justice micro-site) soon!